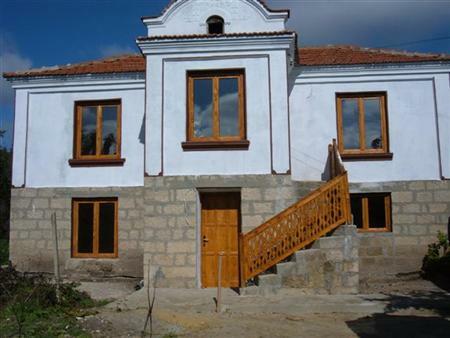 Description: This two level renovated house is located in a popular village, just 30 min from Varna Airpoprt. The house comprises an entrance hallway, two rooms and 2 bathroom/WC. The property is very good for relocation or a rural holiday home. Wooden flooring to all rooms, terracotta tiled entrance hallways, tiled bathrooms/WC. The property is set on a good sized plot ( 1500 sq.m ) featuring BBQ area, a stone/wood gazebo and a water well. The well appointed village also benefits from the proximity and the amenities of the second biggest town in Varna district, Provadia (5 km away). The area is famous with the Rocky Monasteries. It is a beautiful location presenting nice panoramic views to the surrounding hills and forests. The Black sea pearl Varna is at 49 km distance. Located in the end of the village, so you may have lovely view to hills and forest. There is a church, shops, a pub. Fascinating nature, fishing and hunting opportunities attract more and more new comers in the region. It is could be your favorite house for holidays, just come and buy it! ENJOY THE BEAUTIFUL NATURE !